Our main research interest is the great diversity of cephalopods—mostly squid—that live in New Zealand waters. Our squid and octopus species comprise one of the highest cephalopod diversities in the world, and we find new taxa here on a regular basis. We study the diversity and ecology of these beautiful and fascinating animals, from the very smallest 'fire' squids (family Pyroteuthidae) up to the giant and colossal squids. 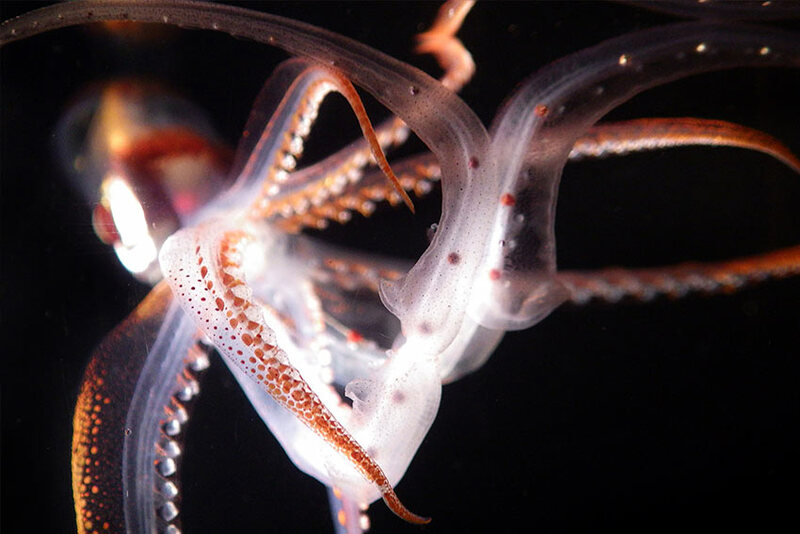 Through projects focusing on systematics, genetics, trophic interactions, and vision, especially in deep-sea squids, we seek to better understand these unique animals' biology and their roles in New Zealand's marine ecosystems. Some of our higher-profile projects involve the largest known cephalopod species: the giant squid (Architeuthis dux) and the colossal squid (Mesonychoteuthis hamiltoni). In 2014, ALCES members participated in two public webcast events focusing on these animals—a dissection of three Architeuthis specimens on site at AUT in June, and an examination of the most recent colossal squid specimen to arrive at the Museum of New Zealand Te Papa Tongarewa, as part of the Museum’s Science Live series. Samples collected during these events are forming the basis of more than a dozen collaborative projects by lab members and international colleagues, investigating these animals’ biology and ecology. New Zealand waters host an extraordinary diversity of cephalopod species, and many of our ongoing projects aim to clarify our local species composition and their role within Southern Ocean ecosystems. 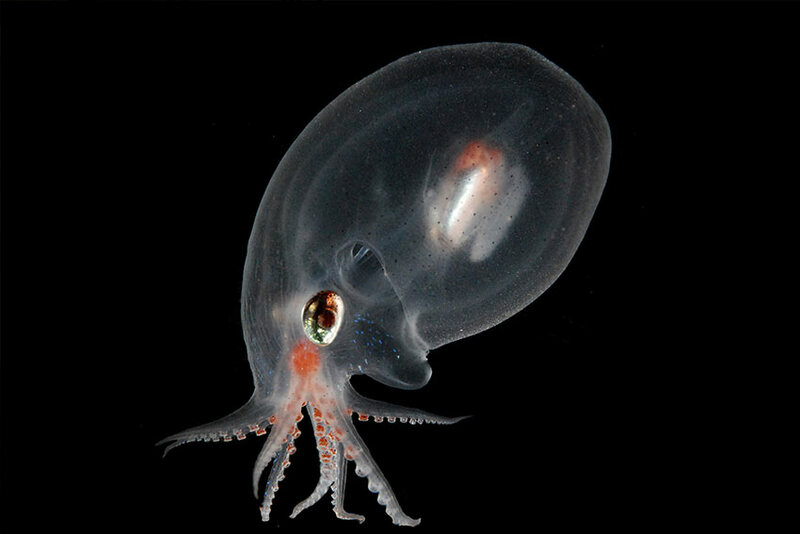 We are currently investigating the systematics (local and global) of a number of deep-sea oegopsid squid families, many of which include local representatives that are new to science. Our biodiversity research is supported by the excellent collections and ongoing sampling initiatives of the Museum of New Zealand Te Papa Tongarewa, and the National Institute of Water and Atmospheric Research, Ltd (NIWA). 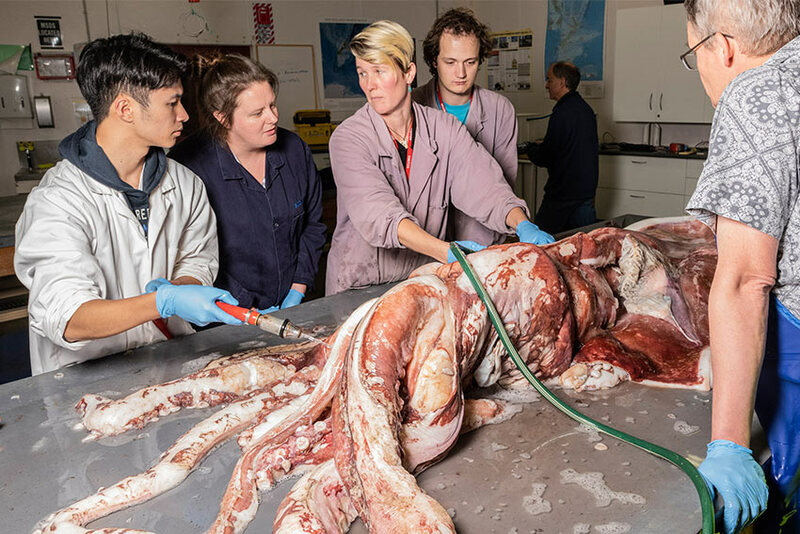 Squid science at AUT began with Dr Steve O’Shea, who first captured paralarval (baby) giant squid and participated in the expedition that obtained the first in-situ footage of live adult giant squid off Japan in 2012. Steve has now retired and the lab is run by Dr Kat Bolstad, a deep-sea squid biologist originally from the USA. Kat has conducted research at the Smithsonian Institution, the New England Aquarium and the Monterey Bay Aquarium Research Institute, in addition to her work at AUT. She has participated in documentaries and dived in submersibles to depths of 1000m in the Antarctic to observe deep-sea cephalopods. Her current research interests include systematics, ecology, biodiversity, and vision, primarily of deep-sea squids. 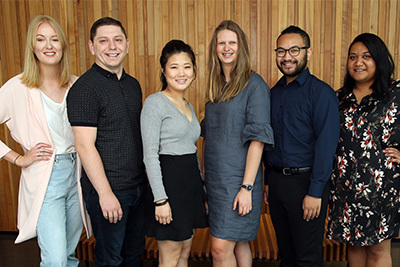 We welcome enquiries about undergraduate and postgraduate project availability in our lab, and we can sometimes accommodate interns (unpaid) during the second half of the calendar year (July–December). ALCES lab members at the Cephalopod International Advisory Council (CIAC) Symposium, Hakodate, Japan, 2015. The Octopus News Magazine Online - a website for cephalopod scientist and enthusiasts from all walks of life.